New!! See a video demoing how the features of Web Essentials are ported to Visual Studio 11. The Web Essentials extension lets you perform common tasks much easier. This is a work in progress, and more features being added soon. Follow me on Twitter to get up-to-date info about the frequent updates to this extension. You can also use UserVoice to vote up new features that you would like in Web Essentials. Right-click your web project item in Solution Explorer and click "Live Web Preview" to show the window and load the website. You can also just type CTRL+ALT+Enter to do the same. 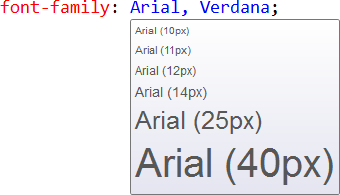 A lot of the new CSS 3 properties only work cross-browser if vendor specific properties are added. These include -moz, -webkit, -ms and -o. The result is the insertion of the missing vendor specific properties in the right order. If one or more of the vendor specific properties are already present, then only the missing ones are added. When the cursor is in or next to a numeric value such as 5px, .6em, 15% or just 23, you can use CTRL+UP to increase the number and CTRL+DOWN to decrease it. The feature is known from FireBug. This will take the referenced image and base64 encode it directly into your stylesheet. You have then eliminated an HTTP requst. If the base64 string becomes to long, you can easily collapse it. Use (CTRL+K, CTRL+C) to comment the selection and (CTRL+K, CTRL+U) to uncomment. 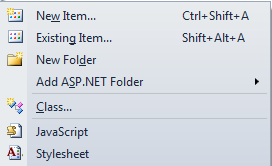 This is the same keyboard shotcut as in the C#/VB editors. A glyph in the left margin of the CSS and JS editor is shown whenever it finds the text "TODO" in any comment in the document. Select the text you want to surround with a region, right-click the selection and click "Surround with region". This will insert the region comments that makes it possible to collapse and expand regions as needed. A Smart Tag on every selector enables you to easily sort all the properties alphabetically within the rule. 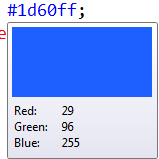 All rules and @-directives now get's code outlining which can be collapsed and expanded as needed. Drag and image onto the editor from either Solution Explorer or your desktop and a background-image property will be inserted with the relative path to the image file. Do the same with a font file, but in this case all font files with the same name but different extensions (.ttf, .eot, .woff, .otf) will be added to the same @font-face rule. Specific hacks can be used to target specific versions of IE on a selector level. These are all valid according to the W3C. 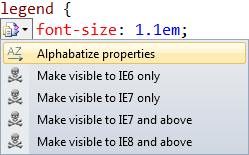 Makes it easy to apply the CSS hacks needed to target specific versions of IE. You can now collapse functions, if-statements, loops and other structures just like in C#. To provide better overview over more complex functions and other structures, brace highlighting helps to quickly identify which braces belongs together. All instances of the word that the caret is placed in will be highlighted. This makes it easy to see where variables are used. When you drag a user control from Solution explorer onto a page, master page or another user control, you will now get a correctly registered and inserted reference. Before it would create an <a> element pointing to the user control instead of adding it as expected.